Photograph courtesy of Alisdare Hickson at Flickr. Let’s make something clear: I absolutely hate vegetarian diets. I don’t get that moral overdose, that holier-than-thou-art ego boost some people get from eating salads and dry veggie burgers from the Handschumacher Dining Center every day. I mean, I used to have some pretty intense arguments with my friends over what burger joint made the best patty. My only restriction on what I ate for dinner was how much I had eaten for lunch. Everything about eating vegetarian would be absolute hell for me. That being said, I’ve been a vegetarian for over a month now. So why am I forcing (and believe me when I say forcing) myself to do this? I mean, I’m a pretty healthy, athletic person. This isn’t for health, and it sure isn’t for kicks. The simple fact is that when it comes to big-picture issues, I’m tired of not being able to do anything. Problems like climate change and environmental impacts are important, but as an 18-year-old college student who can’t exactly afford to drive a Tesla, there really aren’t too many actions I can take to stop the systematic destruction of an entire biosphere. In reality, there aren’t too many actions individuals can take. According to the Environmental Protection Agency, only 28.5 percent of all greenhouse gas emissions in the United States come from transportation-related fuel use, and only 11 percent come from sources such as the heating system in buildings and landfill fumes. 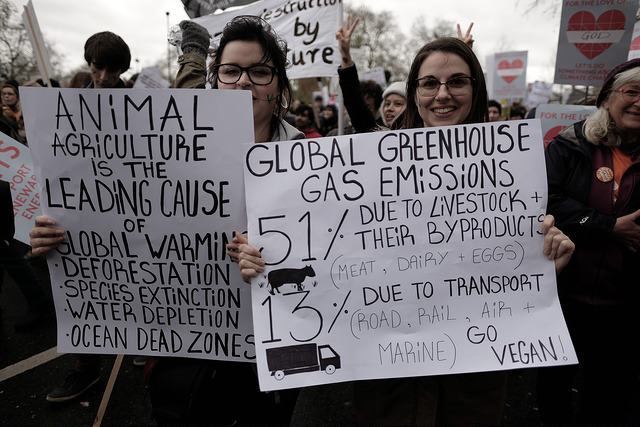 What this means is that the other almost four billion metric tons of carbon dioxide equivalent released by the U.S. come from agriculture (which includes meat production), industry and energy generation, making them largely out of our control. This is, in my opinion, why climate change is still such a big problem. Complain about diesel cars all you want, but even if every person in the country was rich enough to afford electric, that electricity would still be generated by fossil fuels. As a population, we can’t just march to the gates of the local power plant and berate them for polluting our Earth. That’s a job for government-scale regulation and reform. At this point, you’re probably bored. You’ve probably heard the argument before that our tacky reusable shopping bags are, shockingly, not enough to stop the ice from melting. This isn’t that big of a revelation, and I’m pretty sure deep down everyone knew it anyway. Besides, wasn’t this an article about being vegetarian? But, fortunately, this isn’t about me doing something I hate, even though it’s futile. This is about me doing something that I really, really hate, even though it’s futile, because staying positive in the face of insurmountable problems is the only way we will fix them. No, as mere citizens we can’t directly fix the climate, but as the foundation of this country’s government we can stress the importance of it. Elected officials will, hopefully, pass regulations to stop the collapse of all life on our planet, but if you read about how it’s all industry’s fault, and then sit back and feel justified about your new coal-burning space heater, you’ve only passed the blame to someone else and ignored the problem. My dietary lifestyle isn’t because I honestly think that eating quinoa will tear the meatpacking industry up from the roots and magically solve all our problems. I do this because it makes me feel better. I know I am actually making a difference, even if it is only miniscule. If you give up — if you feel like nothing you do can fix this — it’s easy to become overwhelmed. Find something that makes you satisfied, like picking up a bit of trash on the street, or passing up the chili corn dog, or using those reusable shopping bags. After that? Don’t stop fighting.